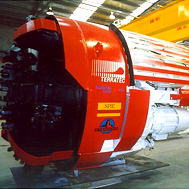 Incorporated in 1990, TERRATEC is the world-renowned Australian designer and manufacturer of Tunnel Boring Machines, Raise Boring Machines and other custom-made products for tunnelling and mining applications. TERRATEC’s success is based on the experience and excellence of its engineering team. The team includes engineers with over 40 years experience in the design and manufacture of tunneling and mining machines who have also worked on some of the world’s largest underground projects. TERRATEC is fully managed by Engineers and this gives quick and efficient solutions to meet the Customer’s expectations. TERRATEC products are well-known in the industry as Robust, Durable and Safe, basic principles which must prevail in the conception of any equipment made to work in the extreme conditions encountered underground. As a provider of Total Tunnelling Solutions, TERRATEC’s scope of work extends to include operation and maintenance of boring equipment during the execution of works as well as supply of ancillary equipment. Today, TERRATEC is well placed to meet the growing global market, demanding the highest Quality and Reliability of Equipment for fast and efficient execution of tunneling Projects anywhere in the World.